Gallatin County, is a county in the northeastern part of the U.S. state of Kentucky. As of the 2010 census, the population was 8,589. Its county seat is Warsaw. 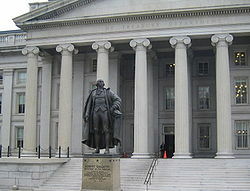 The county was founded in 1798 and named for Albert Gallatin, the Secretary of the Treasury under President Thomas Jefferson. The county was formed on December 14, 1798. Gallatin was the 31st Kentucky county to be established. It was derived from parts of Franklin and Shelby counties. Later, parts of the county were pared off to create three additional counties: Owen in 1819, Trimble in 1836, and Carroll in 1838. Today Gallatin is one tenth of its original size. Its northern border is the Ohio River. The Lynchings of the Frenches of Warsaw were conducted by a white mob on May 3, 1876. It was unusual as Benjamin and Mollie French were killed for the murder of Lake Jones, another, older African-American man. They were hanged by local masked KKK members. As the 20th century progressed, commercial river trade began to decline, and the steamboat era ended, as faster means of transportation became available. Rail lines expanded, automobiles and trucks became reliable, and aircraft soon arrived on the scene. In the postwar period after World War II, numerous major highways were constructed, leading to greater auto travel and commuting. Gallatin County is traversed by I-71, U.S. 42, and U.S. 127. By the 1980s, more than 50 percent of the population was employed outside the county. Construction on the Markland Locks and Dam began in 1956 and was completed in 1964. In 1967 a hydroelectric power plant was built at the dam, which provided jobs. Marco Allen Chapman was executed in 2008 for multiple murders he committed on August 23, 2002 in Warsaw, Kentucky. He murdered two children, Chelbi Sharon, 7, and Cody Sharon, 6, by slitting their throats. He raped and stabbed their mother, Carolyn Marksberry, more than 15 times. A third child, daughter 10-year-old Courtney Sharon, played dead after being stabbed and then escaped. Thirty-seven-year-old Chapman was executed on November 21, 2008 by lethal injection at the Kentucky State Penitentiary in Eddyville, Kentucky. He was the last person executed by the Commonwealth. As of the census of 2000, there were 7,870 people, 2,902 households, and 2,135 families residing in the county. The population density was 80 per square mile (31/km2). There were 3,362 housing units at an average density of 34 per square mile (13/km2). The racial makeup of the county was 96.72% White, 1.59% Black or African American, 0.18% Native American, 0.22% Asian, 0.25% from other races, and 1.04% from two or more races. 1.04% of the population were Hispanic or Latino of any race. Interstate 71 runs through Gallatin County, with three exits around Sparta and Glencoe. Public transportation is provided by Senior Services of Northern Kentucky with demand-response service. ^ E., Kleber, John; Kentucky, University Press of; Policy, Institute for Regional Analysis and Public; Library, Camden-Carroll; University, Morehead State (1 January 2000). "The Kentucky Encyclopedia". ^ Libraries, University of Kentucky. "Notable Kentucky African Americans - Gallatin County (KY) Slaves, Free Blacks, and Free Mulattoes, 1850-1870". ^ Wright, George C. 1990. Racial Violence in Kentucky, 1865–1940: Lynchings, Mob Rule, and "Legal Lynchings". Baton Rouge and London: Louisiana State University Press, pp. 98-99. ^ "Kentucky death row inmate: 'I'm ready and I'm sorry'". USATODAY.com. Retrieved 2017-02-24. ^ "Supreme Court of Kentucky. Marco Allen CHAPMAN, Appellant, v. COMMONWEALTH of Kentucky, Appellee. No. 2005-SC-000070-MR. Decided: August 23, 2007". FindLaw. Retrieved February 13, 2017. ^ "Kentucky Counties". Uky.edu. Retrieved 2017-02-24. ^ "SSNK Transportation Services". Senior Services of Northern Kentucky. Archived from the original on 2015-05-20. Retrieved 2015-05-19.